I love French fries like I love my children: They make me happy and I can’t imagine my life without them. When I was pregnant with my first son, Jack, all I wanted was French fries. Actually, it was cheese fries, which literally is gooey fried heaven on a plate. It was no surprise that when Jack was a toddler he instinctively dipped his French fries in his macaroni and cheese. As good as traditional French fries are, I thought I’d celebrate this year with something a little healthier. But that doesn’t mean we’ve invited some party poopers to our party. If anything, it’s better! Sweet potatoes are so amazing and one of my favorite things on Earth. Plus, look at how pretty the color is. Who doesn’t like the color orange – and how can this color not make anyone happy? 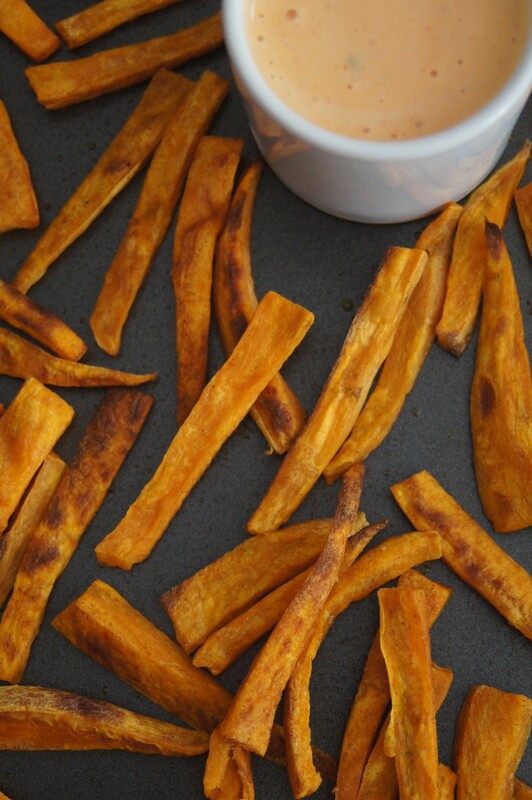 Whenever I see sweet potato fries on a menu I have to have them. And if a restaurant is serving sweet potato tater tots…sorry, I just lost my train of thought thinking about them and their deliciousness. Don’t get me wrong, anything – and I mean anything – fried is always good. But making the fries in the oven is so much better, less messy, and your chances of getting 2nd degree burns from grease splatter are zero. I usually like having these sweet potato fries with ketchup or barbeque sauce. But they’re so flavorful they don’t need them. And that’s a good thing, especially when I’m too lazy to get up and get some ketchup. 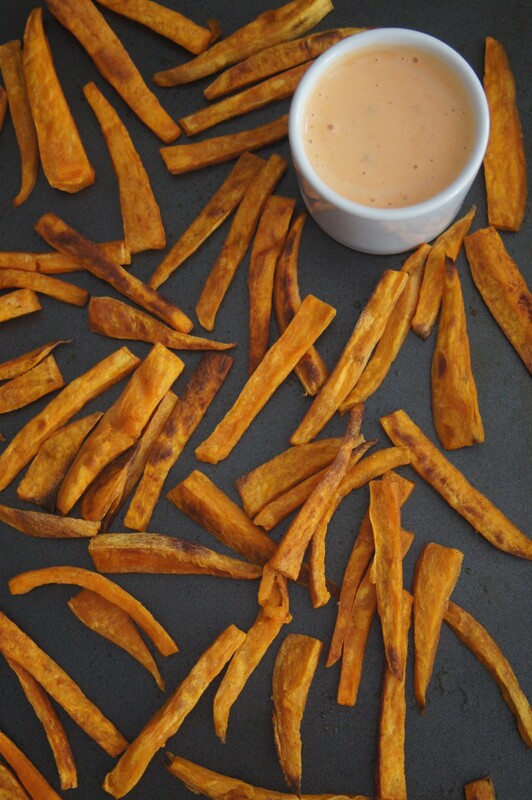 But on special occasions – like National French Fry Day – they do deserve a dipping sauce. For today’s holiday I thought Sriracha mayo would be perfect. For me, it’s almost like the party dress of condiments because I don’t use it very often and I have to put a little more effort into it (as opposed to squeezing a bottle). But in the end it’s worth it because it complements the sweet potato fries so well and the colors are a great match! An added bonus to the Sriracha mayo is that it’s great on a burger too. 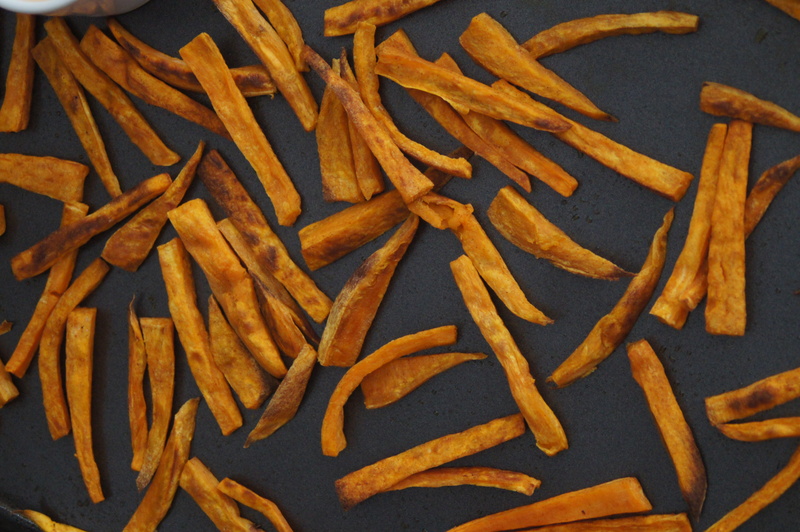 Place fries on a baking sheet and coat in oil, salt, and cinnamon, tossing to combine. Lay fries flat on the baking sheet, making sure not to overcrowd the fries. Overcrowding will steam them and prevent them from getting crispy. Mix all ingredients in a bowl and serve. To make a larger amount of dipping sauce mix ½ cup mayonnaise, ¼ cup Sriracha, and 1-2 Tablespoons of sweet potato relish.